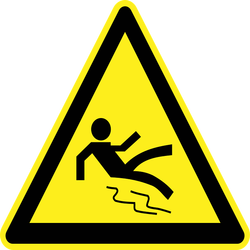 A slip and fall accident can occur almost anywhere. However, they are more common in retail spaces and office buildings. The owners of the business have a legal obligation to ensure that the space is safe for the public and employees. However, the majority of slip and fall accidents result from sloppy cleaning practices. These type of accidents can be a major drain on a business financially because the company may be held liable for the medical bills associated with the accident, as well as, loss of earnings incurred by the victim. 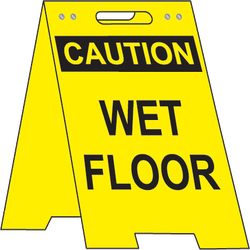 To decrease the likelihood that such an incident occurs at your business, you should make sure that you identify common areas for wet floors and make sure that the appropriate caution cleaning in progress and caution wet floor sign posts are in place. By putting an appropriate cleaning plan in place that specifically focuses on these areas, you can ensure that wet floors are appropriately marked as such. While you may be able to mark wet floors after cleaning, it is not always easy to anticipate spills. However, signs should be used to warn people that are passing by of the potential danger. Whether the spill has yet to be cleaned, cleaning is in progress, or the floors have a tendency to be slippery when wet, a slippery when wet sign or caution cleaning in progress sign should be used. Make sure that these signs are on hand at your business so that they can be placed down immediately whenever there is a wet floor that creates a risk situation for your business. If you want your business to be successful, don’t risk wasting time or money on potential slip and fall accidents. Make sure that you takes the appropriate actions to protect customers and employees from slipping and falling.